One of my all time favorite candies is candy corn. They are so sweet, delicious and beautiful! I seriously adore the colors. 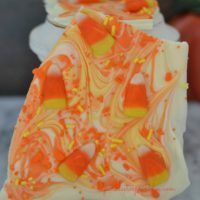 Just seeing the combination of yellow, orange and white immediately makes me think of candy corn, which makes me think of Halloween, which makes me smile. This candy corn bark just makes me happy looking at it. You can not imagine just how delicious it is. 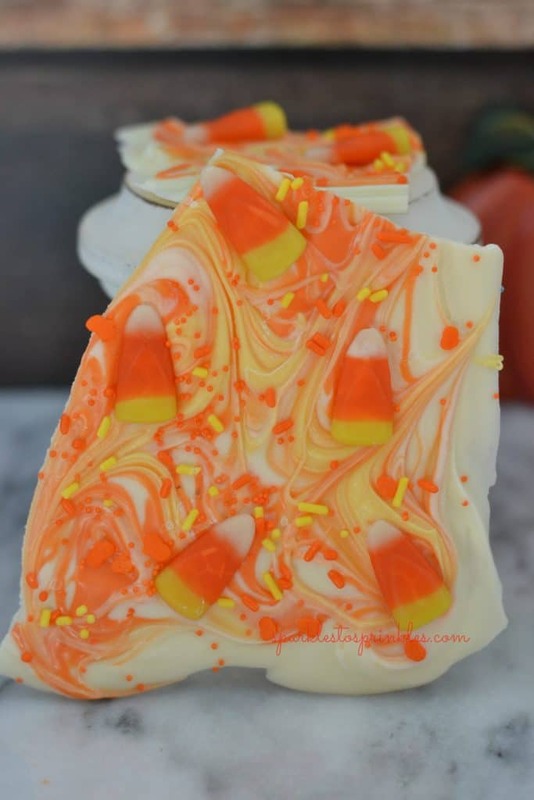 You really need to make this if you love candy corn as much as me. In a microwave-safe container microwave candy melts at 50% power or the defrost setting on your microwave. Melt for one minute to start. Remove and stir. Place back in the microwave for additional 30 seconds at 50% power. Remove and stir. Continue to do this in 30 second intervals until smooth and creamy. Remember less is better. You can help melt some pieces that are still not fully melted by stirring with a spoon. You do not want to over microwave your chocolate. Orange & Yellow Sprinkles, mine had brown sprinkles in the mix also, I picked them out since I just wanted orange and yellow sprinkles. Melt chocolate morsels according to my melting chocolate directions above. Spread white chocolate on top of parchment paper. Drizzle orange & yellow chocolate across the white chocolate. Use the back of a butter knife to swirl the orange & yellow chocolate into the white chocolate. Now quickly sprinkle with your orange & yellow sprinkles. Finish off with adding some pumpkin sprinkles. Let chocolate completely harden before breaking into bite sized pieces.